07.07.18 – It seemed Osiris himself, the Egyptian God of the Afterlife, was watching over us as we came back from the brink against BBCA to score a cracking 4.5-3.5 win on Wednesday night. BBCA raced into an early lead before the Hammer fightback took hold and wins for Tommaso, Blair, Matteo and Ken secured victory. 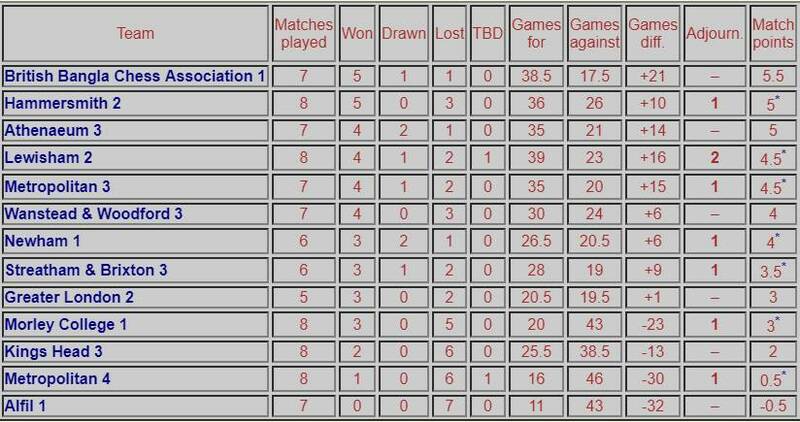 We’re 2nd in the table with 4 matches to go – Greater London, Newham, Kings Head and Metro 4. There were some truly impressive performances, no more so than Tomasso on Board 1, taking down a 175 with some superb attacking chess. An early g4 pawn push, complemented with an early King chase at the expense of material. Blair was bizarrely challenged to go back to his schooldays and prove his “Rook & King” checkmate skills with more than adequate time on the clock. He obviously hasn’t been studying his form for Hammer this season. Blair maintains his 100% record with 2 wins out of 2. Matteo’s rediscovered his mojo and is now turning draws into wins, taking control of this match-up early on and pressing home to an endgame with superior pawns and a Knight for a Bishop. There was no way to stop the promotion to a Queen and that was that. Playing black against the Sicilian, Brian established a Maroczy Bing in response to relatively passive play. But that all changed on move 9 when he faced a veritable kitchen sink being thrown forward in a kingside attack. Pawn pushes with e4 and h4-h5, two rooks on the f-file, Queen on g4 and a fianchettoed Bishop on b2. Brian swapped both bishops for two knights and advanced his Q-side pawns. The opposition Queen eventually invaded on the sixth rank to threaten my a-pawn, but faced the counter-challenge of Queen and rook on the 7th threatening to take the a2 pawn and invade the seventh/eighth rank on his side. Eventually his opponent’s Queen became trapped on the Q-side, with no alternative but to exchange queens for a drawn ending of rook & minor piece each, with a totally blocked pawn structure. The scorecard might have flattered us further on another night. Nadhmi and Gokhan both got themselves into strong positions before allowing their opponents to spoil the party. I’m afraid I didn’t see much of Ben or Ken’s games although I understand a significant blunder effectively ended the latter as a contents.